From 2005 to 2007 I worked on a project to document the natural history of Wanuskewin Heritage Park near Saskatoon. The original idea was to publish a book about the park. However, the book project was put on hold. 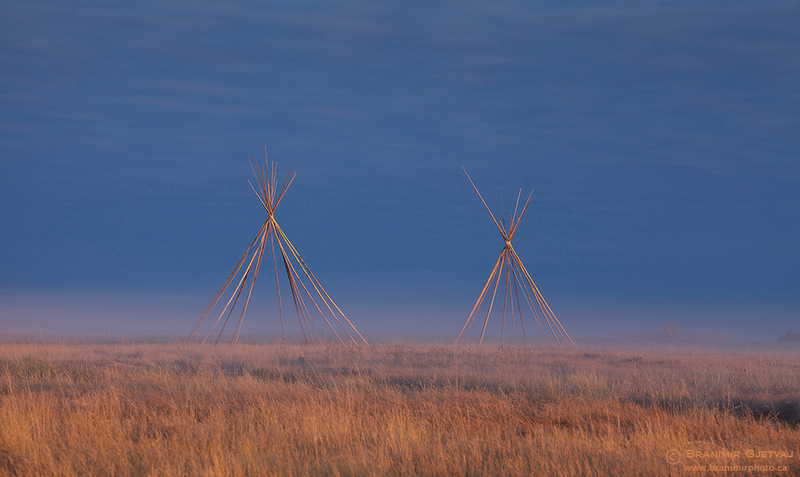 In the meantime, a few images have been used by Wanuskewin for gallery displays, promotional material and on the web site. See the photo gallery with sample images from this project. Wanuskewin Heritage Park is a National Historic Site located 5 km north of Saskatoon, Saskatchewan. The park hosts 19 archaeological sites harbouring pre-contact cultural elements created by the Northern Plains People. These include summer and winter camp sites, several tipi rings, bison driving lanes and jumps, and a well preserved medicine wheel (a cairn or rock pile surrounded by a circle of small stones) of special religious significance to Indigenous peoples. An interpretive centre built in the shape of a large tipi was designed to reflect cultural values of the nomadic tribes who inhabited this area over a period of several thousand years. 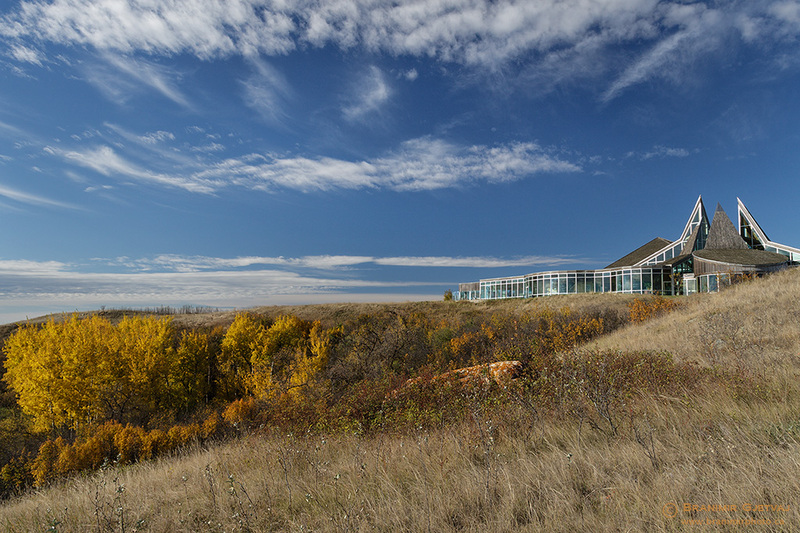 The centre has a very nice museum, an art gallery with rotating exhibits, a gift shop, and a restaurant offering traditional foods such as bison stew and bannock. Outdoor amphitheatre and activity areas are used for dance demonstrations, theatre plays and storytelling. Numerous interpretive programs are presented throughout the year. The area’s natural beauty continues to attract visitors. On its 320 acres, the park features a wide variety of scenic landscapes. A meandering network of trails leads the visitor to a diverse collection of natural areas and archaeological sites. There are over 6 km of well marked trails with interpretive signs, rest stops and great viewpoints. The Opimihaw Creek (formerly known as Tipperary Creek) bisects the park in the north-south direction, while the eroding action of the South Saskatchewan River forms steep cliffs along the south edge called Cathedral Peak. A rest stop on the east end of the 1.3 km long Trail of the Buffalo provides a magnificent view of the valley below. Coulees extend into the uplands from the two river valleys, creating diverse and picturesque landscapes. Prairie uplands make up most of the park; about half of this area was under agricultural production. The undisturbed upland meadows represent a good example of Mixed Grass Prairie with abundant spear grass, blue gramma, and wheat grass. Interspersed patches of shrubs add to the variety. The valley slopes along Opimihaw Creek support patches of forest vegetation, with balsam poplar, green ash, Manitoba maple, trembling aspen and birch. Here one can find well developed shrub stands of choke cherry, rose, snowberry, and saskatoon berry. This is the best area to find a multitude of migrating and nesting songbirds. In the absence of livestock grazing since the mid 1980s, the terrace along the Opimihaw Creek is slowly reverting from a savanna-type landscape to a sparse forest of choke cherry and balsam poplar. The springs and several active beaver dams create a small but very rich wetland habitat along the creek, with cattail, willow and cottonwood trees. This is an excellent area for waterfowl viewing and photography. Dense forest along the banks of the South Saskatchewan River provides good nesting habitat for raptors such as hawks and owls. White-tailed deer are abundant in the park. Although coyotes, badgers, and red foxes were reported in the area, I was not lucky enough to see one. Directions to the Wanuskewin Heritage Park: go north from Saskatoon on Warman Road (called Wanuskewin Rd. north of 51st Street), drive past a chemical plant, turn right (east) on Penner Road – look for bison signs – and continue a short drive to the park entrance on your right. Or take Highway #11 north of Saskatoon and look for the bison signs about 5 km from city limits. Be aware that the park gates are locked 9 p.m. – 9 a.m. from Victoria Day to Labour Day, 5 p.m. – 9 a.m. the rest of the year. Plan your early morning and late afternoon photography accordingly. Visit the park’s web site for more information about program and events (external link).